B2 has been designed to be a great value B/W cart-based system. The B2 has an excellent ergonomic design. The high resolution 15" LCD monitor with an articulated arm and a rational rotational handle will provide you with outstanding ergonomics. 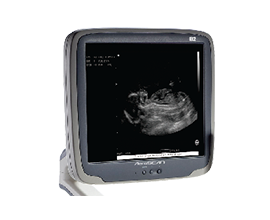 Ultra large 160mm*160mm imaging area provides a more comfortable viewing experience and a more accurate diagnosis for various applications, which is a truly advanced function found in no other systems of the same class. 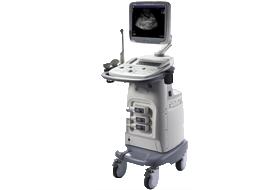 What’s more, the slim and mobile; performing diagnosis in small spaces or moving speedily among rooms. 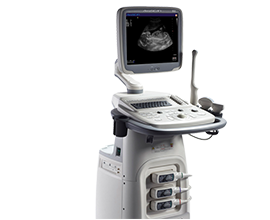 PC compatible PDF report functions lets makes the diagnostic findings more concise for sonographers while the diagnostic reports are clearer for patients., such as Pediatric, Musculoskeletal, etc. The B2 also has full patient database solutions, including hard disk, DVD, 4 USB2.0 ports, DICOM3.0 and AVI/JPG format. 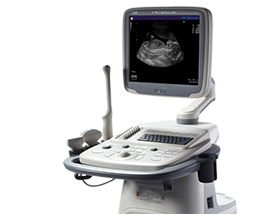 The advanced technologies and smooth workflow used in the B2 will save your precious time with greater image quality and accurate results.M-Tuning optimizes the image quality at the touch of one a button. This function significantly reduces operating time and improves the consistency and accuracy of diagnosis.Clipboard function for quick patient image capturing and reviewing enables users to retrieve and read previous results both for doctors and images immediately on the screen. Digital measurement hotkeys endowed with user definable formulae offer efficient quick one-key reproduction measurements. 180° transvaginal transducer makes no more tough work is affective even with difficult patients in the for endo-cavity scanning.All of the above which are easy-to-use will give you a different experience and make you enjoy your job. Probe Frequency: Broad band 5 frequency selection,Working frequency 2 Mhz-12 Mhz. Probe Connector: 3 probe ( 2 live + 1 parking ). Gain Control: Overall Gain Control,8 step TGC continuously adjustable. Cine Loop: More than 1000 frames. Image Storage : 320 GB HDD, USB Drive. Connectivity : USB, LAN,S-Video,VGA, DICOM 3.0. Standard Configuration : + 2 Probe Connector, + 1 Convex Probe. 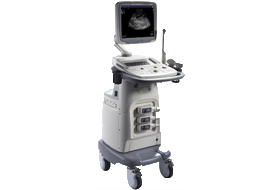 Clinical Application :Abdominal, Vascular, Thyroid, Obstetrics, Gynecology, Cardiac, Urology, Pediatircs, Neonatal Head, Small parts and Adult Cardiac etc. Dynamic Technology : Real time Dynamic scanning.